“Peace On Earth/Little Drummer Boy” - Bing Crosby and David Bowie: This duet goes down as one of the oddest pairings with surprisingly gorgeous results. These two seemingly polar opposites somehow find common ground over a Christmas carol from the 40’s. 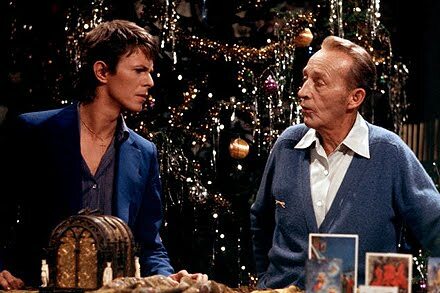 Recorded in 1977 for one of Bing Crosby’s holiday TV specials, the song was featured in a skit where David Bowie drops by the house to play the piano and Bing just happens to be visiting. The visual of the two together is probably more jarring than just the audio because when they start singing, all thoughts of Ziggy Stardust or the calculated crooner melt away. The “Peace On Earth” portion was written specifically for the performance and it really adds a beautiful counterpoint to the “Little Drummer Boy” section. “I Know The Reason” – Mindy Smith and Thad Cockrell: There’s not enough alt-country Christmas songs out there and there’s definitely not enough alt-country Christmas duets. Mindy Smith released My Holiday in 2007 and this duet with Thad Cockrell combines two of my favorite voices in the genre. Both of them sound stellar on this song and I love the non-traditional pairing of a smokier girl’s voice with a higher guy’s harmony. I really like the lyrics to this one too. As much as I loved Christmas as a kid, there’s nothing like spending the holidays with someone you’re in love with. “I’ve Got My Love To Keep Me Warm” – Ella Fitzgerald and Louis Armstrong: Many artists have covered this Irving Berlin classic solo, but hearing it done as a duet with such strong iconic voices makes this version the consummate one for me. It falls into that group of Christmas songs that are more about winter than actually mentioning Christmas specifically, but it works perfectly this time of year. Fun, romantic and instantly recognizable, “I’ve Got My Love To Keep Me Warm” is another great song for date night. I’ve got to thank Amanda for introducing me to this one and for doing a spot-on Louis Armstrong impression when she gets congested. “Baby, It’s Cold Outside” – Zooey Deschanel and Leon Redbone: This song has been covered so much it’s the Christmas equivalent of “Yesterday.” But for my money, no one has done it as good as Zooey and Leon. Recorded for the soundtrack of the hilariously awesome Elf, this duet trumps all other versions for me. Despite their 30+ year age difference, they exude a unique chemistry while playfully trading lines. There’s something so natural and smooth about their rendition that isn’t present in most covers of this song. In fact, there are a few couplings out there that have been just downright creepy. This one has that special something though and it’s overflowing with personality, connection and genuine enhancement from their combined voices, which is exactly what you hope to achieve with a duet. “There Are Much Worse Things To Believe In” – Stephen Colbert and Elvis Costello: “There Are Much Worse Things To Believe In” is just one of the intelligently written and interestingly paired duets from Stephen’s A Colbert Christmas TV special. Like all of Colbert’s work it is as funny as it is thought-provoking. You’ll switch back and forth between laughing and pondering back to laughing to possibly having to look up a word in the dictionary (Let me save you some time, a dyspeptic is a crotchety, pessimistic type person). Any song that describes Santa as “a beast-man giving toys for good behavior” is worth checking out, but the fact that Elvis Costello sings on it makes it even that much better. I could listen to Elvis Costello sing anything, so all of the funny lines and Christmas references are just icing on the cake.